Many residents lost all their belongings in Saturday's storm. Roofs were blown off and homes collapsed under the onslaught of the storm that whipped through the area. “We are just praying that we get help, as we are homeless after the storm on Saturday evening,” said Umbulwane resident Hlengiwe Msimanga. Many people are without a roof over their head and battling to survive after the freak storm that tore through the Ladysmith area on Saturday, reports Ladysmith Gazette. Umbulwane, Steadville, and the surrounding areas were particularly badly affected. Many roofs were blown off and some homes collapsed under the onslaught of the storm. Children are wandering around without clothes and shoes, as all their belongings are trapped under the rubble. 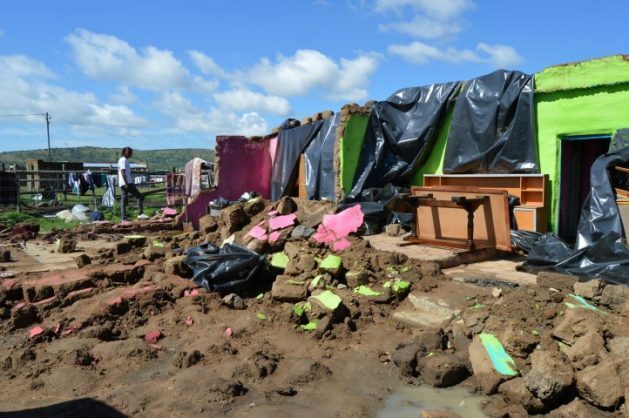 KwaZulu-Natal cooperative governance and traditional affairs department (Cogta) MEC Nomusa Dube-Ncube was on Sunday leading disaster teams to assist the victims, provide emergency relief, and assess the damage, the department said. “We would like to assure the affected communities that we will do all in our power to mitigate the impact of the families affected. We have activated all our teams and other intervener departments. Those families that have had to be evacuated from the area in the wake of yesterday’s [Saturday] ferocious storm have already been accommodated in a community hall,” Dube-Ncube said in the statement.